One-nation conservatism (also known as one-nationism, or Tory democracy) is a form of British political conservatism that views society as organic and values paternalism and pragmatism. The phrase "One-nation Tory" originated with Benjamin Disraeli (1804–1881), who served as the chief Conservative spokesman and became Prime Minister in February 1868. He devised it to appeal to working-class men as a solution to worsening divisions in society through introducing factory and health Acts, as well as greater protection for workers. As a political philosophy, one-nation conservatism reflects the belief that societies exist and develop organically, and that members within them have obligations towards each other. There is particular emphasis on the paternalistic obligation of those who are privileged and wealthy to the poorer parts of society. 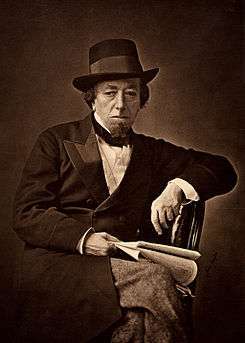 Benjamin Disraeli, widely considered the architect of one-nation conservatism. One-nation conservatism was first conceived by the Conservative British Prime Minister Benjamin Disraeli, who presented his political philosophy in two novels – Sybil, Or The Two Nations and Coningsby – published in 1845 and 1844 respectively. Disraeli's conservatism proposed a paternalistic society with the social classes intact but with the working class receiving support from the establishment. He emphasised the importance of social obligation rather than the individualism that pervaded his society. Disraeli warned that Britain would become divided into two "nations", of the rich and poor, as a result of increased industrialisation and inequality. Concerned at this division, he supported measures to improve the lives of the people to provide social support and protect the working classes. Benjamin Disraeli adopted one-nation conservatism for both ethical and electoral reasons. Before he became leader of the Conservative Party, Disraeli had announced that, as a result of the Reform Act 1867 which had enfranchised the male working class, the party needed to pursue social reforms if it were to have electoral success. One-nationism would both improve the conditions of the poor and portray the Liberal Party as selfish individualists. Because the party portrayed itself as a national (and not class based) party, its members were unsure whether to make specific appeals to the working classes. A more positive approach to the working class by the party developed later out of the electoral necessity to secure working-class votes. By the end of the 19th century, the Conservatives had moved away from their one-nation ideology and were increasingly supportive of capitalism and free enterprise. During the interwar period, public fear of communism restored the Conservative Party to one-nationism as it defined itself as the party of national unity and began to support moderate reform. As the effects of the Great Depression were felt in Britain, the party was drawn to even greater levels of state intervention. The Conservative Prime Ministers Neville Chamberlain and Stanley Baldwin pursued an interventionist style of conservatism which won them democratic support because of its wide electoral appeal. Throughout the post-war consensus of the 1950s and '60s, the Conservative Party was dominated by one-nation conservatives whose ideas were inspired by Disraeli. The social and economic policies of the consensus appealed to the paternalism of one-nation conservatism because they appeared to provide prosperity and alleviate social problems such as poverty and disease; this was intellectually developed by the 'new conservatism' movement, led by Rab Butler. New conservatism attempted to distinguish itself from the socialism of Anthony Crosland by concentrating welfare on those in need and encouraging people to help themselves, rather than foster dependency on the state. The Conservative Party's 2010 manifesto contained a section on "One World Conservatism" – a commitment to spend 0.7% of national income on well-targeted aid – and David Cameron, the leader of the party and British Prime Minister until 2016, named Disraeli as his favourite Conservative. In 2006, Conservative Member of Parliament Andrew Tyrie published a pamphlet which claimed that Cameron was following the one-nationist path of Disraeli. Phillip Blond, a British political theorist who has had past connections with the Conservative Party, has proposed a renewed version of one-nation conservatism. "I'm a one-nation Tory. There is a duty on the part of the rich to the poor and to the needy, but you are not going to help people express that duty and satisfy it if you punish them fiscally so viciously that they leave this city and this country. I want London to be a competitive, dynamic place to come to work." Daponte-Smith, Noah (2 June 2015). "Is David Cameron Really A One-Nation Conservative?". Forbes. Retrieved 29 February 2016. ↑ McEnhill, Libby. "David Cameron and welfare: a change of rhetoric should not be mistaken for a change of ideology" (PDF). LSE Blogs. Retrieved 20 March 2015. ↑ Griffiths, Simon. "Cameron's "Progressive Conservatism" is largely cosmetic and without substance". LSE Blogs. Retrieved 20 March 2015. ↑ "Theresa May vows to be 'one nation' prime minister". BBC News. Retrieved 14 July 2016. ↑ Dana Arnold (2004). Cultural Identities and the Aesthetics of Britishness. Manchester University Press. p. 96. ↑ "Invitation to Join the Government of Great Britain" (PDF). The Conservative Party. 2010. Retrieved 20 July 2012. 1 2 Blond, Phillip (28 February 2009). "Rise of the red Tories". Prospect. Retrieved 20 July 2012. ↑ Wilson, Graeme (28 December 2006). "Cameron 'heir to Disraeli as a One Nation Tory'". The Telegraph. London. Retrieved 20 July 2012. ↑ Harris, John (8 August 2009). "Phillip Blond: The man who wrote Cameron's mood music". The Guardian. London. Retrieved 10 August 2012. Adams, Ian (1998). Ideology and Politics in Britain Today. Manchester University Press. ISBN 9780719050565. Axford, Barrie; Browning, Gary; Huggins, Richard (2002). Politics: An Introduction. Routledge. ISBN 9780415251815. Bloor, Kevin (2012). The Definitive Guide to Political Ideologies. AuthorHouse. ISBN 9781449067618. Dorey, Peter (1995). The Conservative Party and the Trade Unions. Psychology Press. ISBN 9780415064873. Dorey, Peter (2009). British Conservatism and Trade Unionism, 1945–1964. Ashgate Publishing. ISBN 9780754666592. Evans, Eric (2004). Thatcher and Thatcherism. Routledge. ISBN 9780415270137. Heywood, Andrew (2007). Political Ideologies. Palgrave Macmillan. ISBN 9780230521803.